These water dispersed pigments are exceptionally light fast, yield intense colors, and are formulated specifically for the coloring of paper pulp. They are easy to use and require no rinsing. To ensure maximum color intensity and proper adhesion to the pulp, a retention agent must be added to the pulp before the pigment is applied. Our pigments are supplied by volume sizes. The actual weight varies, depending upon the density of the pigment. This sample set contains all 12 pigments in 2-ounce polypropylene jars, enough to color approximately 24 pounds of dry pulp, depending upon the depth of shade, averaging 1 ounce of pigment per pound of dry pulp. You will need retention agent to enable the pigment to properly adhere to the pulp. Instructions for the use of these pigments can be found under 'resources' on our homepage. 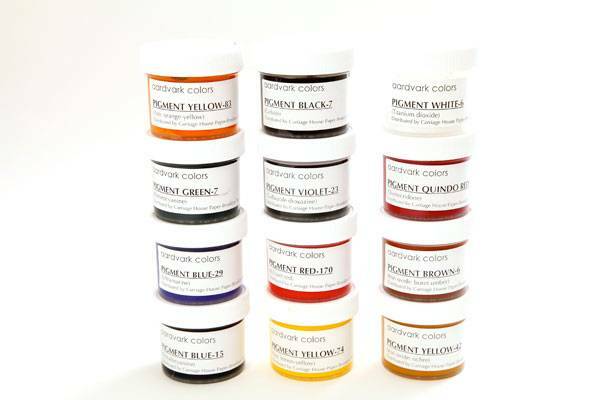 A sample set is available containing all 12 pigments in 2-ounce jars, enough to color approximately 24 pounds of dry pulp, depending upon the depth of shade, averaging 1 ounce of pigment per pound of dry pulp.